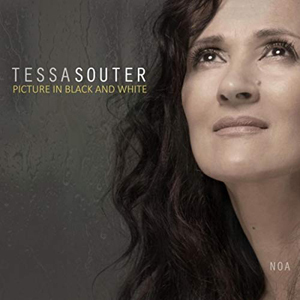 While every recording an artist makes is, in a sense, personal there is no question that Picture in Black and White goes well beyond that for Tessa Souter. All twelve songs on the album embrace aspects of Miss Souter’s bi-racial ancestry both subliminally as well as in the apparent nearness of their individual narratives to Miss Souter’s own. But what makes the connection so special is the manner in which Miss Souter joins the proverbial dots intertwining them with the threads of her own life as if each song magically consists of aspects of herself which she, in turn, reveals in her own heartfelt way. In doing so Miss Souter infuses the conventional song form with an intimacy and an emotional intensity which can aptly be described as the poetry of feeling. Miss Souter has long revealed herself as an artist of the first order, broadening out from the jazz repertory for which she is best known. Her instrument is magnificent; lustrous, precise and feather-light. Her musicianship is fierce as she digs into the expression of each word, brings ceaseless variety to soft dynamics and gives every phrase a special grace. The music effortlessly accentuates these aspects of Miss Souter’s art. Featuring beautifully crafted arrangements of beguiling variety and sensuousness, in every lovingly caressed phrase of Portrait in Black and White, Miss Souter’s love for the great vocal tradition defined by such artistic intimates as Sheila Jordan and Mark Murphy. Her chosen material, with one or two exceptions, judiciously mixes on some of music’s lesser-known gems with famous ones and also includes two originals and one – “Siren Song” – which includes additional Yoruba lyrics written by Miss Souter. Listening to the way in which she seductively bends the notes of that song, and how she sculpts the long, sustained inventions of “Picture in Black and White”, it’s clear that there’s not a semiquaver that hasn’t been fastidiously considered. Featuring the magical rhythm section of bassist Yasushi Nakamura and drummer Billy Drummond together with pianist Adam Platt, guitarist and oud player Yotem Silberstein, percussion colourist Keita Ogawa and cellist Dana Leong, Miss Souter’s musicians are completely attuned to her artistry and vision, which shows magnificently in each performance together. In the ultimate analysis music and musicians have been brought together in this profound performance and with Miss Souter at the helm of affairs, this proves mutually illuminating. From the haunting beauty of the Ghanaian anthem “Kothbiro” through Wayne Shorter’s “Ana Maria’s Song” and a highly evocative version of Ornette Coleman’s “Lonely Woman” featuring Mr Drummond’s wizardry on cymbals and with mallets, and Mr Nakamura’s masterful pizzicato playing on the contrabass, to a mystical performance of Milton Nascimento’s “Nothing Will be As it Was” there is great music making by any measure.